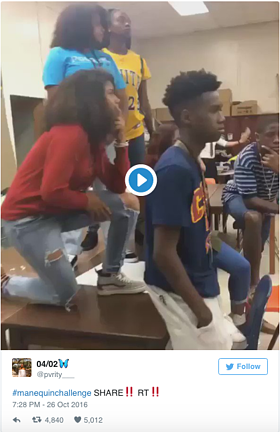 On October 26 of 2016, @pvrity___, a high school student in Jacksonville, FL, tweeted the first video tagged with #MannequinChallenge. In fewer than two months, the meme became so popular that pro football teams, major brands like Target, and even city officials in Westmount, Quebec were copying the teenage fad and posting their own renditions. As with all viral content, however, the #MannequinChallenge eventually died out, and some predicted that the next trend would be the #BackpackChallenge, where (almost exclusively) teenage boys form two lines and throw their backpacks at a friend running between them. However, the #BackpackChallenge never took hold — city officials in Westmount have, to the best of our knowledge, refrained from filming themselves pelting each other with bookbags — and neither did the #SpidermanChallenge, where you jump onto a wall in a pose reminiscent of the comic book hero, or #AndysComing, where you collapse to the ground as if you were a toy from "Toy Story." Why was the #MannequinChallenge able to break into the mainstream while these others languished in the high school cafeteria? There are many reasons, but for brands, the most important thing is being able to capitalize when a trend goes viral. 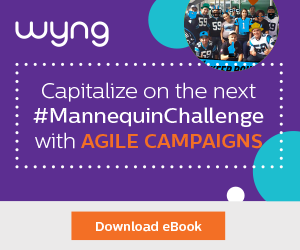 Less than a month after the original tweet, Target had recognized the importance of the #MannequinChallenge, filmed, and posted their own version, demonstrating how responsive and agile modern marketers must be. To learn more about executing successful digital campaigns, download our eBook.